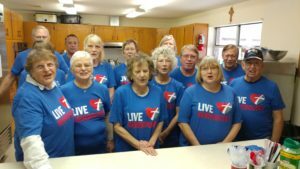 Shepherd of the Bay Lutheran Church in Lillian, AL, hosted a free meal and movie open to all members of the community on Sunday, January 15. The movie was titled, “Luther” and was chosen to honor the church’s celebration of 500 years since the Reformation. Members and guests were treated to an authentic Italian meal consisting of spaghetti with homemade sauce, Italian bread and butter, salad with Italian dressing, dessert, and drinks. 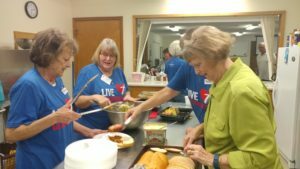 The dinner was sponsored by Thrivent Financial, who provided the monetary assistance to pay for the meal. The crowd enjoyed the movie, meal, and fellowship time. The church is planning to host other activities in 2017 to honor the Reformation. We will be sure to notify the public when those special events are going to take place. Thanks to all who attended and all those who helped make this a success!